HA NOI (VNS) — Ha Noi T&T expect to be ranked at least second this season when the national premier league ends after the next three rounds. If the former champions manage to achieve this much, they would emerge among the top two teams for the fifth year in a row. Their first task today will be to defeat Hoang Anh Gia Lai who are strongly trying to escape any possibility of being pushed into relegation at the Pleiku Stadium. The capital representative are in their form with 11 matches in a row without a loss. The result strongly pushed them upward from fairly low in the ranks to the second position now with 43 points. "Ha Noi T&T have a chance to be the runners-up this season but also face a threat to not figure even in the top three," said coach Phan Thanh Hung. "Our rivals (Hoang Anh Gia Lai, Quang Ninh Coal and Dong Tam Long An) look below our level but they have their own targets so we have to try our best in every game." Talking about today's match versus Hoang Anh Gia Lai, Hung said the team were rising up and was confident now after the recent two wins. "Playing against them this time will be a challenge for any team. The match will be tense and aggressively played, I think," Hung said. "They are at the dead-end now. They will definitely play with even more than 100 per cent of their power against us. The return of their key player, Nguyen Cong Phuong, to this match will help them better plan to attack our net." Today, Ha Noi T&T will not have their midfielder Duong Thanh Hao and defender Sam Ngoc Duc will find himself sidelined because of yellow cards. Despite difficulties, Hung believed in a win for his team. He said there would be no mercy for Hoang Anh Gia Lai. "Since I started working with Ha Noi T&T, it is the best team I have ever played with. For the match tomorrow, Hoang Anh Gia Lai have an advantage of being a host, just all," Hung said. The match is one of the three that have come in for special focus by the organisers trying to avoid any instance of match fixing. The Viet Nam Football Federation said police are invited to watch the game. Three FIFA-certificated referees will adjudge the match. VTV6 channel will be airing the match live from 5pm. 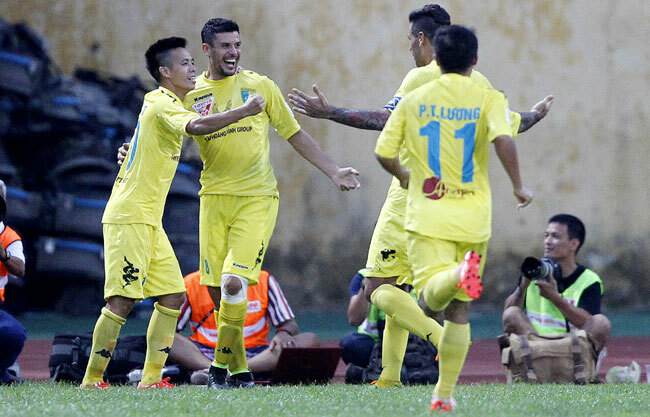 In the first leg match, Ha Noi T&T won 4-3.